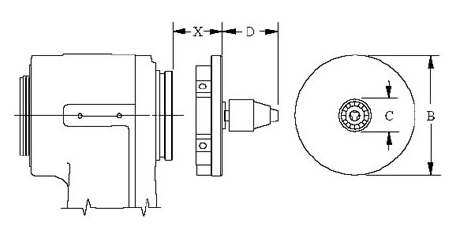 Diameter of chuck base - 51mm / 2"
Approximate length of chuck, jaws closed - 93mm / 3-9/16"
Three sizes of drill chucks are available ready for use with all models of Litton lathes. They come with a mounting wrench only, as hand rightening is sufficient when used with glass tubing. Churck iszes, capacities and model numbers are listed below. 3-3/16" 5-7/16" 5-7/16" 7-1/2" 7-1/4" 10-3/4" 12-1/16" 12-3/4"
.5375" .400" .750" .591" .555" .525" .400" 1,050"